First effort 100 per cent amateur ! 24.09.14 signed some form of agreement in Canterbury. 24.09.14 to 3.01.17 Some type of training or preparation? adult bird on his arm. 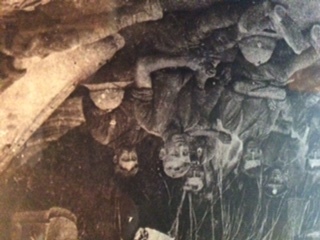 Dress and headgear indicates this was taken in a hot climate. Who took this picture, does anyone else have a this picture ? 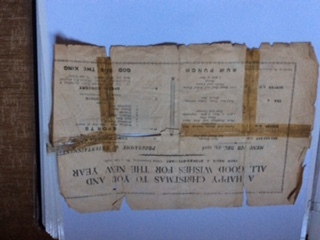 Can anyone fill in the gaps or offer further information ? Page 306 - 662 formed 29 March 1916. These reserve units were for training recruits. He joined the TF aged 17 years 1 month, this was the minimum legitimate age for service in the TF (as always there are exceptions). Enlistment in the TF was for 'home service'. 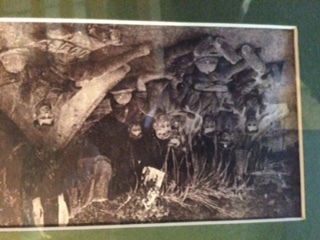 When war was declared the TF was 'embodied', he was embodied on the 6th August 1914. He would have been issued with a badge, but there was some controversy over young TF soldiers being posted on active service overseas, although many were. In February 1915 there was an Army Order expressing disapproval of this practice as it was at odds with the Regular Army where the policy was aged 20 years for active service overseas. This is probably why he was posted to various reserve units on home service, during this time he learned to drive a truck. The 81st Field Ambulance was part of 27th Division which, after leaving Salonika was ordered to the Black Sea. http://www.1914-1918.net/27div.htm He was 'discharged' at Crystal Palace Dispersal Unit when the Division returned to the UK on 15 August 1919 and was disembodied on 12th September 1919. What Ken posted makes sense 81st Field Ambulance would be attached to 81st Brigade in the 27th Division. 27th Division operated in the section of the front line along the Struma valley, northe east of Salonika. Just a short follow up Brighton was the home of the Home Counties Divisional Transport and Supply Column (among many other units) in 1914 when he first enlisted. The HQ company was at 117 Gloucester Road if you're still local. Thank you all for your responses. I all seems to fit in. I have a thousand questions to ask but will try to contain myself. It seems clear now that my GF was attached to 81st Field Ambulance as a driver from the ASC. He was sent to Salonika as reinforcements on the 03.01.17. How would he have got there and would he have known he was going to be attached to 81st Field Ambulance. Being a T4 would he have driven a vehicle or a horse. When he eventually left Salonika how did he get to the Balkans. When he left the Balkans how did he get to Crystal Palace. I know he suffered from Malaria. Would this have been treated locally ? 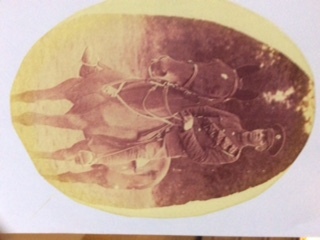 The prefix T4 indicates horsed transport (and the 4 Kitchener's Fourth Army) there is a note on his protection certificate at the top of the page that I originally read as MT Driver (hence my comment about driving a truck) but on closer inspection it's more likely 'HT' or Horse Transport. He would certainly have known he was going to Salonika as he would have been issued with tropical kit, as to his final posting it's difficult to say but if you look at the link I gave you all the Brigade Field Ambulances were previously Home Counties TF units (the 1st was based at Maidstone and other towns in Kent). He was probably part of a larger draft of men sent to the theatre and would have travelled on a troopship. I don't know if port movements survive. The war diary often gives the name of the ship the main body went out on but are unlikely to mention reinforcements. Hostilities in Salonika ceased at noon on 30th September when Bulgaria surrendered. The Division was sent to Batum, and the first elements arrived there on the 22nd December, with the last ship arriving on 31st January 1919, moving a Division with all its transport and horses etc was not a quick job. The Divisional HQ was at Tiflis but units were sent out across the Trans Caucasus to protect oil supplies from Baku along the pipeline to Batum. The Division began withdrawal in August and the 81st Brigade was disbanded on the 14th September, however Pte Goldsmith was at the dispersal centre on the 15th August so it's probably difficult to be accurate as to how and when he returned home but again the war diary might help. I am not sure that you can make this assumption, at that time the Army was notorious for not telling the ranks anything and tropical kit could mean, Africa, Mesopotamia or even India. OK not 'certainly', but he certainly knew he wasn't going to France when he was issued with his pith helmet and shorts so he'd have a clue and he'd certainly know when he got on the boat. Wouldn't you ask where you were going to be posted? Afaik men posted to India could find themselves in Mesop, but Salonika? Wrong sea. One supposes the fact he was taken off strength of the unit he was leaving would appear in their daily/weekly orders. Once aboard a troop ship even if they were not told directly word would have got around I suspect and once in the Mediterranean there were only a few possibilities, Egypt , Italy or Salonika. I have only stiudied 2 war diaries and both recorded the comings and goings of men joining or leaving the units. The officers are named the ranks were not. So in the case of my Grandfather I know from his service record when he arrived in Salonika and the unit he joined records the arrival of a draft of men shortly afterwards so I can be 99% sure that he was one of that draft. I am fairly sure that the reserve units kept diaries as well so it is possible that when Ray's Grandfather was transferred to the 81st FA the 662nd diary would record the number of men transferred and the date. Also the 81st FA diary may well record the arrival of drafts. Apologies for being a pedant! Home Service (and therefore Reserve) units were not required to keep a war diary. The war diary had a clearly defined purpose i.e. 'to provide an accurate record of operations..and to collect information for future reference...'. Ken if home reserve units didn't have diaries, what documentation did they keep and do you know if it survived? Most importantly the requirement was for the diary to be kept 'on active service' as pointed out in post 7 of the above thread 'only one of fourteen Yeomanry units that landed at Suvla Bay kept a diary from the beginning of the war'. As reserve units were not on active service they did not maintain a diary. They would of course have a system of daily/weekly orders (a forum member recently posted one for the MGC Training School but this was an interesting fragment rather than a record, I can't find the link at the moment). They would also maintain a system of returns for the War Office and were subject to inspections and maintaining a vast amount of administrative paperwork. None of this has survived in any easily searchable form but like the MGC copy referred to above would have been invaluable to identify postings. This link to the LLT lists the documents known to have been destroyed in the Arnside Fire http://www.1914-1918.net/arnside.html As Chris notes in the article perhaps the most significant loss to researchers were the Part II Orders for all branches which listed the movement of men. Unfortunately this means the answer to your question is the records of most interest from the Reserve units did not survive, though as will all things to do with the war there will be exceptions. I have seen the documents destroyed list on the LLT but not the thread on war diaries, I will check it out when I have some time. Thanks for the info. It is a great help. Now I have 3 photos of my GF I would like you to study please. Any feedback would be great. Two were taken in the UK and one in Salonika I thInk. Also I have the name of another ASC Driver who was sent to Salonika on the same day as my GF 3.1.17. Driver George Deacon T4/234693 Is this significant. additional picture attached. Sorry they are the wrong way round any suggestions to put it right. You need a photo editor in Mac Preview will do it or there is one bundled with Windows. The limit for photos is 250kb at the moment apart from being skewed these are too small to see any detail. Suggest you sort them out on your PC first then post them singly. Have a look at using this website or do a forum search on loading photos and you will find lots of hints and tips and links to free software. The group photo may be more interesting the others seem to confirm what is known i.e. that he was ASC Horse Transport. As regards the second soldier it may be significant if his records survive; the number may help as well as men were usually posted into theatre in drafts rather than singly. There is a section on the forum homepage called 'Website and Technical' with a forum 'Using the Technology' select this then in the search box type 'photo editing'. A number of useful threads will appear. Thanks for the info. will have a look. Bit a technophobe I m afraid. Making good progress with my research. Another member has sent me a casualty form active service. Some it is typed - deep joy. Confirms my GF sailed for Salonika on the 3.1.17 from Southampton on HT Londonderry. 857 AT Coy. What does AT stand for ? 81st was not a complete red herring. He did serve with them but this was one of his his last posting. Thinking about it 81 was only mentioned on his later docs. so makes sense. Starting to get a good idea of his service. I get the impression ACS drivers HT were military equivalent of grooms and were attached to various units/brigades to look after and sometime ride horses. This is how I see the story so far. Joined TFJune 2014. Embodied 05.08.14. Trained for 6 months possibly at Canterbury Station. Sent to 662 coy after training .Sent to Salonika. 03.1.17. Do you think he would have known when he joined the TF that less than 2 months later he would be called up ? that could give me an insight as to their training and day to day routine ? Micheal young's ASC book has 857 HT attached to 28th Division in Salonika and described as an Auxiliary Pack Company. The roads in Macedonia at the time were very poor and mostly unsuitable for motor transport. Most of the supply was carried out by pack animals, primarily mules. It looks like your man was in one of these pack animal companies. 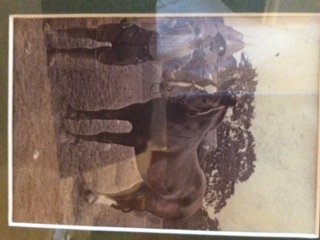 He would have ridden/walked with them on supply duty and probably been responsible for looking after the animals. Going back to your photos if you have a windows machine, click on the photo file and it will open in the windows picture viewer. If you click the rotate button, a semicircular arrow below the picture, it will rotate. If you repeat this until the photo is the right way around then close it, it will be saved the right way up. Once you have your pictures the right way around it might be worth posting them in the Paraphernalia forum under uniforms. there are some forum members who are brilliant at working out units etc from uniform pictures. Do you think he would have known when he joined the TF that less than 2 months later he would be called up ? The Army numbering system was changed in 1920 but I don't think that's what you mean. As for your rhetorical question I'd suggest that as he joined the TF at the earliest opportunity he wasn't really bothered about going to war but happy to escape the humdrum. He was not 'called up' but 'embodied' for active service - the proclamation is on the LLT http://www.1914-1918.net/reserves_tf_mobilised.html - he knew when he joined the TF he would be required to serve full time in the event of war though at the time he was probably more interested in two weeks summer camp - but who knows? Do you think anyone would be interested in this. 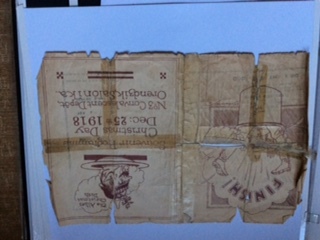 It is a souvenir programme for Christmas Day 1918 at the No.3 Convalescent Depot Orendzik Salonka. Can anyone tell me what or where Orendzik is. Orendzik (on old maps also Dzeki, Eurendjik, Örendžik, Uredžik, Urendgik, Redžik, Ceki) is now the suburb of Pefka (though still known unofficially as Retziki). I'm pretty sure No.3 Convalescent Depot was around the junction of Mikras Asias and Kimiseos Theotokou streets, Google Earth 40.658 22.989. Hello I wonder if you could help me as I research my great grandfather John Henry perkins who was a shoesmith/farrier in the 573 RASC HT. It appears that he was sent to Salonika in 1916 to the 3rd?? base camp. Any information would be appreciated.